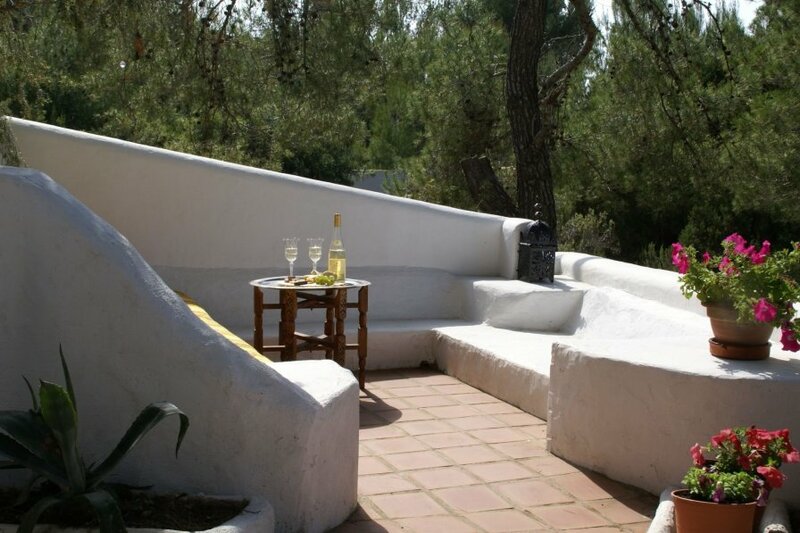 This charming villa is in Ibizan style. It lies hidden in the hills between San José and San Antonio on the south-west coast of Ibiza. The coastline here is one of the most beautiful areas on the island. The romantic beaches, azure sea and pine covered hills show Ibiza at its most beautiful. Villa Iza Belén is the perfect place to completely relax. The beautiful terrace enjoys splendid views of the area with San Antonio in the distance. The villa is on Colina Anibalt Hill and has grounds of around 1000 m2. The grounds are divided into two terraces. The terrace at the back of the house is cool in summer thanks to its many trees. The sun terrace with swimming pool enjoys the sun all day long. There is a beautiful natural stone terrace with comfortable sun loungers around the large swimming pool. It is all surrounded by a beautiful landscaped garden with a profusion of plants and palms. The grounds are enclosed and very well suited for families with children. The living room has a large, built-in dining area with seating for eight to ten people. The lounge has comfortable sofas, an open fireplace and is in the same area. You reach the partly covered terrace through the large sliding doors. There is a spacious chill out area with built-in brick bench at the side of the terrace. Youll find complete rest and privacy here and enjoy a splendid view of the valley and sea. You can see the bay and San Antonio Harbour in the background. Youll find the terrace table and a built-in brick barbecue on the terrace. You reach the two large bedrooms from the hall. Each has a large double bed, one of which is a four poster. A bathroom with bath, separate shower, wash basin and toilet is adjacent. The kitchen is fully equipped with 5 burner gas cooker, a large fridge, combi microwave oven and a dishwasher. The villa is a few minutes by car from the village of San José with its attractive pavement cafes, restaurants and shops. There are a number of small bays in the vicinity. This is a perfect base for discovering Ibiza and everything about it. Hola and welcome to Ibiza! calendars on the Internet (ibiza-spotlight.com/night/club), you can go to clubs like Pacha and Amnesia, take a distant pre-made mojito at the bar of El Ayoun and you start the night all right! Tips for around the house, near the villa grows a lott of rosemary and tomijo (thyme that grows in the Mediterranean grows, has little blue flowers), buy at the Eroski (supermarkets) lamb chops (chulletas de cordero), put them in the oil marinade before you go to the beach so they can marinate. In the evening you will have a great BBQ with a glass of wine and you will enjoy the view!